In all projects it is important to be able to maintain access to key decision makers within a company in order to keep a project on task and on budget. In the case of GWES, the Client Manager (Burke Murph) is a Principal of the company. 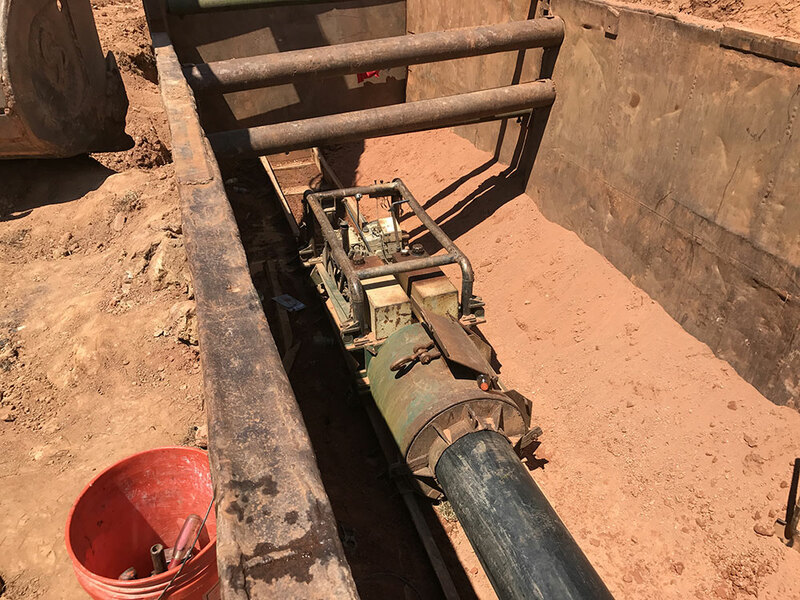 This standard operating procedure continues to save the Client time and money when decisions need to be made in an efficient and effective manner, as was the case in the PVC Water Main Replacement Brown Bridge Road Project. In 2015, NCWSA requested engineering services to plan, design, bid, and oversee construction of the water main replacement project. GWES was tasked with providing NCWSA with the most efficient and feasible installation of approximately 11,900 linear feet of 12-inch DIP water main that met NCWSA standards and the intended service delivery strategy. The existing 8-inch PVC pipe water main was located within the south right-of-way of Brown Bridge Road in a residential and commercial corridor. 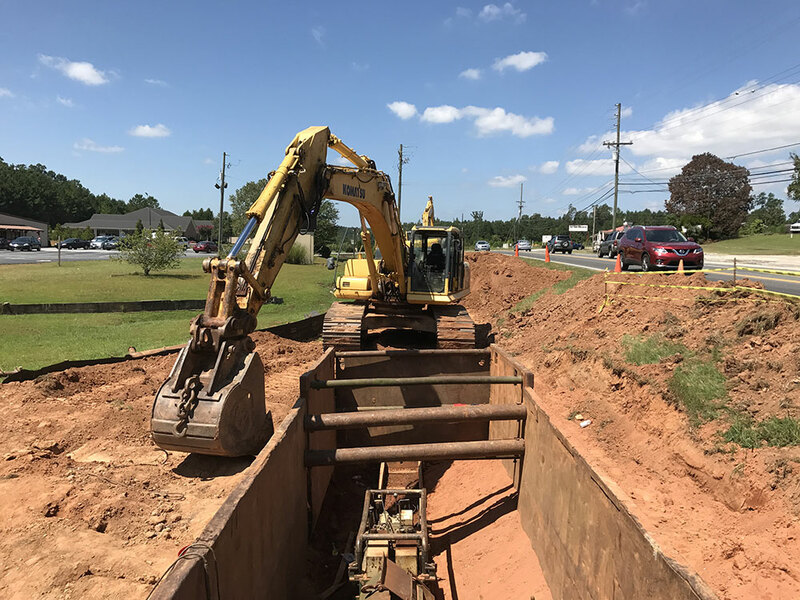 Considerations including multiple, existing overhead and underground utilities played a major role in GWES’s selected alignment of the 12-inch water main. These utilities included gravity sewer, existing water main, hydrants, valves, inter-connections and services, overhead power, telephone, and power poles, and underground cable and fiber. Multiple culvert crossings, as well as a crossing of a double box culvert at Beaver Creek, required GWES to perform stream and wetland jurisdictional delineations. During the planning phase, our team met with NCWSA personnel and reviewed existing information within the project area. GWES used experience with similar projects to determine the most adequate method of reaching NCWSA’s goals for successful completion of the water main replacement project. Through consistent communication between Mr. Murph and NCWSA, GWES was able to assist NCWSA in making informed decisions with regards to project budget, schedule, and design. The planning phase included coordination with NCWSA, regulatory authorities, and development of a conceptual design. It also included field reconnaissance and engineering survey. Once planning was complete, Mr. Murph and our team worked hand-in-hand with NCWSA to begin the design engineering phase. This phase included development of preliminary and final design drawings, and preparation of the project specifications. On May 6, 2016, GWES submitted the Final Contract Documents to NCWSA. The permitting phase of the project was completed concurrently with the planning and engineering phases. The permitting phase was critical to the successful completion of the project relative to the schedule and GWES’ goal to keep the project on schedule and on budget. Once NCWSA and regulatory authority approved of all permit and design documentation, GWES assisted NCWSA during the bidding phase of the project. GWES solicited qualified contractors to perform the work, conducted a pre-bid conference, answered RFIs and clarifications, prepared addenda, conducted the bid opening, and reviewed bids. Based on our evaluation, GWES recommended that the project be awarded to Mid-South Builders Inc. for the bid amount of $1,332,434.00. NCWSA accepted GWES’ recommendation and awarded the project to Mid-South Builders. The construction administration phase began on February 23, 2017 as GWES conducted the pre-construction conference between NCWSA, Mid-South Builders, and representatives from Newton County. The Notice-to-Proceed was executed on April 3rd. GWES continued construction administration services by reviewing submittals, answering RFIs, performing monthly observations, conducting monthly construction review meetings, reviewing pay requests, developing a final punch-list, and performing project closeout activities. Through consistent communication, astute project management, and adherence to the Plans and Specifications, the PVC Water Main Replacement Brown Bridge Road Project reached substantial completion on October 13, 2017.